An exhibition of graphic design by the office of Otl Aicher for the 1972 Munich Olympics. Otl Aicher (1922�1991) is a major figure in 20th century graphic design. 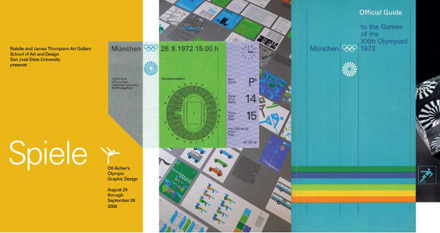 Aicher�s comprehensive work for the 1972 Munich Olympics is the definitive example for today�s graphic identity and branding programs. The posters, tickets, books, brochures, uniforms, signage, and architectural graphics in this exhibit demonstrate the playful humanity and exuberance that simple elements of icon, type, color, and texture are capable of producing when in the mind and hands of a master designer. This major exhibition will include 50 posters as well as dozens of other objects from the 1972 Olympics and other identity projects by B�ro Aicher. This page contains a single entry from August 13, 2008 3:54 PM. The previous post in this blog was $4000 Fellowship Grants for Indivual Artists. The next post in this blog is STREET MRKT Sept 5th at A.D..